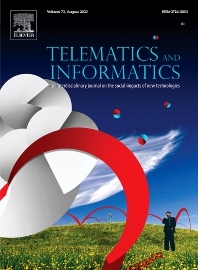 Telematics and Informatics is an interdisciplinary journal publishing innovative theoretical and methodological research on the social, economic, geographic, political, and cultural impacts of digital technologies. Application areas include smart cities, sensors and information fusion, the digital society and digital platforms, internet of things (IoT), cyber-physical technologies, privacy, knowledge management, distributed work, emergency response and hazards, mobile and wireless communications, health informatics, psychosocial effects of social media, ICT for sustainable development, blockchain, e-commerce, and e-government. The Journal favors research papers (8,000 words) but will consider contributions offering systematic review and meta-analysis (10,000 words), as well as research notes (4,000 words) that seek to advance new ideas, theoretical perspectives or methodological approaches. Telematics and Informatics serves as an international outlet for information scientists, data scientists, computer scientists, social informaticists, geographic information scientists, urban and regional planners, policy analysts, regional scientists, disaster scientists, and network scientists.